I haven’t been feeling especially motivated to blog lately, but stay tuned… there’s some good stuff in the works. The Hubbard interview was a cool thing in a lot of ways, and it prompted me to spend some time contacting other players that I admire so I could interview them as well. Getting in touch with these world-renowned drummers was surprisingly easy, and they’ve all been very gracious and more than happy to geek out and talk shop with me. The theme has been studio work, and I’ve got quite a few interviews in the cue now. So, be on the lookout for a great series of posts on studio playing coming soon… featuring exclusive interviews with some of the most proficient and in-demand studio players in our country. It’ll be like my blog Christmas present. Album of the Week #11 was a great record by Matthew Perryman Jones called Throwing Punches In The Dark, featuring Nashville session/touring drummer Andy Hubbard. Hubbard’s playing on Throwing Punches totally rules, and it turns out he’s a super cool guy too. A friend of mine named Alex Young recently interviewed him about the record, and Hubbard has a lot of great insight for studio players. Here’s how the interview went down..
1. What do you think is the best method for getting that vintage, “dead” snare sound? I use a lot of tape and a t-shirt for the dead sounds and most of the really deep fat tones are a Yamaha Anton Fig snare. 2. How do you approach hihat volume in a session, and the problem of hihat bleed in other mics? The producer made it very clear when we were getting to know each other that he does not like a heavy right hand. I tried to use subtle changes in hihat sounds to lift certain sections of songs, and I rarely ever use the tip of the stick. I try really hard to blend the sound of the whole kit, focusing on kick and snare and not burying them under hihat. The hats on the record, by the way, are old old old 15″ Zildjians, and they’re really thin. They’ve never worked in live settings, but I take them to every studio session for sure. 3. What’s your favorite snare for wide-open rock? I like a 5.5×14 Yamaha Paul Leim, 5.5/6.5×14 Yamaha Manu Katche, or a Ludwig Acrolyte. 4. How do you choose a groove for a song? Well, it’s a mixture of input from the artist, producer, and my own instincts. I listen a lot to the strumming patterns of the scratch guitar tracks. 5. Do you compose fills on the fly or pre-meditated? I guess it’s a mixture of planned licks and just feeling the vibe and going from that. 6. What recordings have been most influential to your playing? Jeff Porcaro on Donald Fagen’s “The Night Fly,” and Carlos Vega’s playing with James Taylor and Vince Gill. 7. Do you have a different philosophy for studio playing than you do for live playing? My philosophy for both is to be as professional as possible, to listen to EVERYTHING around me, and to be as present as possible. The approach is different though, in terms of preparedness. I’m always more “prepared” for live stuff. 8. What are some other records you’ve played on? (that you’re proud of…) Well, Throwing punches is my favorite because the whole record was built over the drum tracks that I did with Matthew on acoustic guitar. Nothing else came into the picture at all until drums were done. I’m also proud of a couple of the tracks from Ron Block’s last solo record, a Garrison Starr tune called “No Man’s Land”, and Fernando Ortega’s “Storm” and self-titled record. 9. What’s your opinion on being a multi-faceted player vs a highly specialized player? I just want to be a working musician, so I like the diversity and the opportunity to not turn down a gig because I can’t play it. But I also see the danger of spreading myself too thin… so I end up not being REALLY good at anything. 10. Are vintage Ludwig drums overrated or everything they’re made out to be? I sure love the ’66 or ’67 Ludwig that I played on Throwing Punches! It’s the only kit on the whole record… it records really nice. I dropped the ball on AOTW for two weeks in a row there. Whoops. Had a busy run for the first half of December I guess. Anyway, I’m back at it with a great record for this week… and it’s a blast from the past for me. That’s right, for all the haters out there… I’m putting Phish in the AOTW series, and I don’t feel bad about it. When I was in high school I thought Phish was God’s gift to music… the perfect band that played the perfect songs and never did anything that shouldn’t be wholly praised. Well, let’s just say I think a little differently now. I’ve grown as a musician to the point where I see the legitimacy of much of the criticism commonly brought against the jam band giant, and I’ve not listened to them for more than a hour over the last 6 years. And yet, this week I resurrected their last studio album, called Undermind. Listen people… it’s good. Ok? Just accept it. Phish made A LOT of good records in my opinion, but this final offer from them is undeniably good, and a record where I think they successfully shed a few of their immature habits from the early years, and in so doing they managed to actually put together a SERIOUS recording from the “Jam Band” genre. A big part of Undermind’s coolness is the fact that it was produced by the fantastic Tchad Blake. Blake has never produced anything that didn’t turn into complete awesomeness… and Phish is no exception. It’s actually a testament to Phish’s ontological cool factor that Blake even agreed to do the record, because I’ve heard he’s prone to rejecting offers from serious bands if he thinks they aren’t hip enough… (rumor has it REM has been trying to get Blake to produce one of their records for 10 years, and he won’t even return their phone calls). Blake took most of the things I’ve always disliked about Jon Fishman (Phish’s drummer) and “fixed” them, all while keeping Fishman in his element. The guitar playing is incredible, which is nothing less than expected from band-leader Trey Anastasio (in fact, I highly recommend his self-titled solo album). The songs are a great example of Phish’s aimless lyrics and smart harmonic composition. The flow of the record is comfortable and natural. And the improvising… well, that’s always been their greatest strength. So, just indulge me and check out Undermind by Phish. I think you will like it, and if you don’t… I don’t care. PS. Let me reiterate that Phish is not just a band with a cool record I’ve been listening to lately. Phish’s music was the single-most dominant influence in my formative years of playing music. I’ve seen them 36 times live, and I own over 400 bootleg tapes of their live shows. That’s right… TAPES. The band is an enormous link in the chain of my musical development, and although I don’t consider them to be musical divinity like I once did, I still think anyone/everyone who strives to be creative in making music will benefit from listening to Phish. Super deep kick drums are popular these days, and for good reason. They look super cool. And, the cool-looking, huge kick drum must sound good too, right? Well, no. Extra deep kicks actually don’t sound good at all. It makes a lot of sense, although the situation is the opposite of what you might first think. The resonant head is on the drum to do one job: resonate. And, the closer you put that head to the attack head, the more it will do it’s job to resonate sympathetically with your hits. Therefore, a deep kick drum, although appearing huge, actually sounds quite thin… because of the simple logic that the deep kick puts your res head further away from the attack head, and so it resonates less. Ironically then, the thin kick ends up sounding huge, and the deep kick sounds thin. This makes sense with the course of drum-making history, as early kick drums began with 10″-12″ depths, and have only exceeded 18″ in depth over the last decade. It turns out that the highly sought-after vintage kicks that everybody wants in the studio are ALWAYS 14″ depth, maximum. This was all just logical theory to me before last week, though. For the Sanoski sessions, I brought the Bill Mike kick drum (14×24) and a different acrylic kick that I was borrowing (20×20). We tried the 20×20 first, and then the 14×24… and it was no contest. Now, of course the winning kick was bigger in diameter, which is the biggest factor… so I suppose one could say that it wasn’t a fair shoot-out. But still, I’ve heard great sounding 20-diameter bass drums before, and for the record, the 20×20 didn’t just lose in the comparison, it really didn’t sound good in the studio AT ALL. I think a case can be made, however, for the deep kick drum in a live setting. There are plenty of ways to make ANY kick drum sound great in a live performance, and the deep kicks do look REALLY cool… so there you go. SUMMARY: Super deep kick drums don’t sound nearly as great as they look. Thanks to everyone who came out for the Jason Harms Quintet gig at Bethel last night. I very much enjoyed the performance and the atmosphere surrounding it. Jason and Adrian took a “Tolkien meets Bunyan” approach with this map of the fictitious “Land.” It represents the place where we all often go, when we are thinking too much about the opinions of others, and letting those thoughts drive our actions in a wrong direction. PS. I just put up the opening track from Land of the Fear on my myspace page, as well as one of the tracks from the recent Westwood Church album by Joel Hanson. Joel’s working on a solo record right now, but we play every Sunday night at Westwood and they opted to have us record an album of their favorite worship tunes that we play each week. Last June I spent a week at Pachyderm Studios recording a new record for my friend Jason Harms. The album is now complete, and we will be performing the music in a concert at Bethel University this Tuesday (12/9). The album, titled The Land Of The Fear Of Men, will be available in hard copies with full-color art and print. The cd-release performance will be at the Benson Great Hall on Bethel’s Roseville campus, and we will probably get going around 7:30pm. The music is very powerful, and the event is free… so just show up and enjoy! Check out Jason’s website to learn more about the record. “Razor Grass” is the new name for Joel Hanson’s basement studio, because his lawn is so freaking prickly. I’m here again today finishing up the tracks for Joel’s new record, which is due out February-ish. I think this record is going to totally rule, but I’m obviously biased. We’ll see if I am right. I’m using some “custom Steve Goold creation” hihats on this track we’re doing right now. It’s a crappy Pacific beginner 16″ crash cymbal on the bottom, and an old cracked Paiste Signature Power Crash on the top. Liberal use of hockey tape. Super papery. Man, I love it when you find the right tone for the song. These hats probably wouldn’t work for most tunes, but they are giving me so much inspiration right now. Tonight I’m playing a couple gigs with Ryan Paul & the Ardent, an alt-country-ish thing I’ve been apart of for a little while now. We’re closing out the night with a late set at Lee’s, but before that we’ll be at a very cool event in downtown Minneapolis for Urban Ventures. 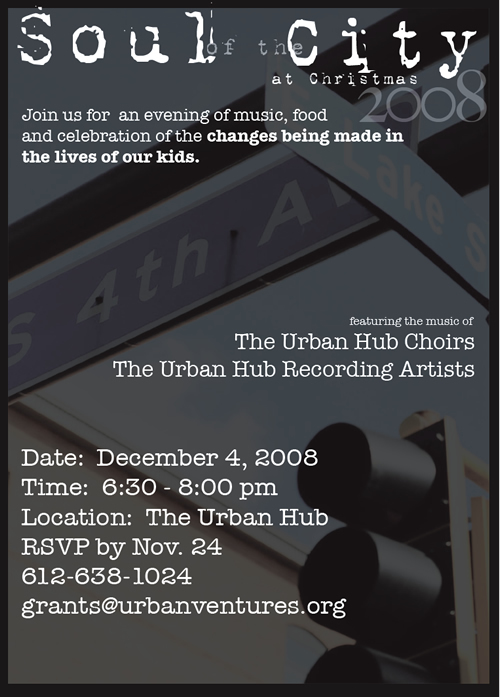 It’s the release-show for a benefit compilation disc recorded at the Urban Hub studio, one of the youth centers operated by Urban Ventures. We tracked a tune for the album a few months ago, and I really like the mission of this organization. I suppose it’s just a standard “get kids off the street” kind of thing, but the folks at Urban Ventures seem very sincere and they’ve had a great effect in the Minneapolis neighborhoods. Disregard the RSVP thing, and come check it out tonight if you can!